Cold Brook School was found as a stone ruin covered with vegetation and rubbish. The structure's remarkable reconstruction and restoration is a tribute to all involved in bringing this building back to life. Begun in May of 1993 and opened in 1997, Cold Brook School is home to the Readington Museums' fourth grade living history program, presented in partnership with the Readington Township Schools. Long before there was a state law requiring public education, there were schools in Readington. Cold Brook School is really the second of three schools located in the village of Potterstown. The first was located somewhere near the current school, but the exact site and date of construction are unknown. Cold Brook School, built in 1828 is the second school. At that time there was no central Board of Education and no school tax levied by the municipality. Each school elected its own Trustees to oversee the educational and financial matters of the institution. In the 1830s there was a teacher shortage. Frequently, young men and women not long out of their teens would teach for a year or two to earn enough money to continue their own education at a University or Normal school. The teacher would often "board in" or live with families of their students. Each family was expected to take its turn housing the teacher. Taylor's Mill is a stone gristmill built c. 1760 by Colonel John Taylor. The mill is located at the southwest corner of Taylor's Mill Road and Rockaway Road on the Readington/Tewksbury border. 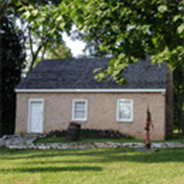 Taylor's Mill is the last surviving pre-Revolutionary mill in Readington Township and eastern Hunterdon County. It played a significant role in the Revolution by providing grain for the troops. John Taylor, who served in the Revolution as a member of the 4th Hunterdon Militia, and eventually achieved the rank of General, was an Englishman by birth, owned and ran the mill. The mill is on the National Register of Historic Places and documentation for nomination describes the mill as being significant for its importance to local history, for studying early patterns of industry and commerce, for studying the architecture of early mills (Taylor's Mill is typical 18th century mill construction), and for understanding the importance of local business in support of the military effort during the Revolution. The mill has received basic stabilization and restoration but is far from complete.